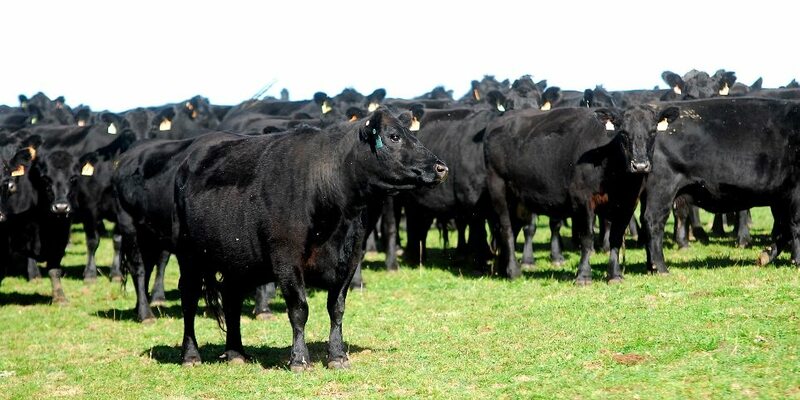 THE US Angus seedstock industry will embrace the next big advance in genetic selection technology in July, when it adopts single-step genetic evaluation to calculate expected progeny differences (EPDs) – the equivalent of Australian Breedplan’s EBVs. Explaining the process and what it offers at the recent Angus Australia annual conference in Ballarat was Dr Dan Moser, president of Angus Genetics Inc and director of performance programs with the American Angus Association. “It’s an incredible time to be involved in genetics and breeding Angus cattle,” Dr Moser said. Single-step genetic evaluation will incorporate all genotype, pedigree, performance and progeny data simultaneously to deliver ‘genetically-enhanced EPDs’, rather than requiring multiple steps, as in the current method. He said genomics was the ‘tool of choice’ right now, and the technology that seedstock breeders everywhere were most excited about. Angus breeders had adopted the technology more than other breeds in the US – doing perhaps four to five times the amount of genotyping that all the other breeds in the US were doing, combined. About one third of the annual Angus seedstock registrations in the US were now genomically tested, representing around 110,000 head, Dr Moser said. “Some of that is because as early adopters, we have more accurate predictions than most other breeds. But genomics really is a transformative technology, in that we are able to make decisions much earlier, to better understand the value in young animals, and make breeding decisions on those young animals with a higher degree of confidence,” he said. Genomics also allowed seedstock producers to make predictions on traits that were difficult to characterise – issues like feed efficiency or mature cow size. Similarly, being able to better gauge carcase traits like marbling and carcase weight through genomics was attractive to breeders. A big part of the emphasis in breeding programs in the US Angus was directed at better improving the consumer characteristics like marbling, cutability and carcase weight, Dr Moser said. For the first time in history, some genetic progress was also being made in traits like dry matter intake, and residual average daily gain as a measure of feed efficiency in cattle, he said. US Angus had had an EPD for residual average daily gain (a measure of efficiency, much like RFI) for a number of years, Dr Moser said. “But if you look at an American Angus bull sale catalogue, you almost never see that value published. It wasn’t something that breeders really emphasised, or they didn’t understand it,” he said. Over time, from 2004-2014, dry matter intake had been going up in Angus cattle in the US. And the trend was not happening at the expense of other traits. The challenge now was to come up with a total index that allows US Angus breeders to do the same thing for heifer pregnancy and other traits of importance on the ranch. Despite the considerable potential it provided, genomic testing without the backup of actual performance data was really meaningless, Dr Moser warned. “I’m afraid to tell you that that day will probably never happen,” he said. Dr Moser said one attribute that set beef and dairy cattle seedstock producers apart from those in chicken and pork was the free and open exchange of information and data, for everyone’s benefit. “We are better able to compete with those other proteins, because we do share that data openly. It’s a very important part of our success,” he said. Dr Moser spoke about the evolution of genomic testing, and how breeders were now testing much ‘deeper’ into their herds, as the costs came down, and performance improved. The same applied when ranking heifers. He provided an example of a herd with Angus heifers, where based on their pedigree and EPD data, they were determined to be good in five or six traits, but perhaps deficient in one or two others. When AI sires were chosen to use over those heifers, selections were typically made to try to correct for that. “But when we did genomic testing on those heifers, some of those animals did not have the problems we thought. In those cases we need to pick a different AI sire. We also find some elite performing donor females a little earlier, using genomics,” he said. Dr Moser said because genomics was ‘new and exciting’, and the seedstock breeder had spent money on DNA testing, there was a temptation to focus solely on the genomics. Dr Moser said the US Angus industry would transition in July to single step genomic evaluation. “We’ve been working on it for three years, and are very close to releasing it for use,” he said. “It’s something that we think is more accurate than what we have today. It has already been implemented in Holstein programs, and poultry. So we’re not really the guinea pigs – we’re kind of the last ones to make the transition,” he said. Dr Moser said the advent of genomic testing shifted some of the responsibility, and the risk, in variation in cattle from the commercial breeder, back to the seedstock producer. Some commercial breeders had built in ‘artificially high’ numbers in terms of EPDs on their bull selections, in order to ‘factor in’ some of the risk in variation in progeny. “With genomic testing, maybe they don’t need to do that quite as much. Maybe they can be accepting of EPD values that are not quite as high, provided they have more confidence in the accuracy behind them,” he said. Genomic testing also changed some of the industry paradigms around ‘It’s all about the males,’ Dr Moser said. Despite the US Angus industry’s reputation for being a world leader in genetic improvement in beef cattle, Dr Moser said it watched very closely what Angus seedstock breeders were doing in Australia. He said Australian Angus breeding indexes were still more advanced than those in the US. 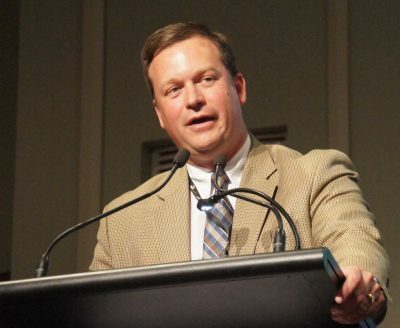 “Ours are very segmented – we have weaned calf value index ($W) and terminal grid value index ($G), but the US does not yet have a good target for somebody that wants to improve both carcase merit and reproductive traits at the same time. Dr Moser said the US Angus industry was also working towards a cow longevity EPD, as this had ‘huge economic ramifications’ for customers of Angus bulls. Hair coat shedding and foot structure were other traits of interest. Nice to hear that Angus breeders no longer even need to look at the cow………just continue to “breed by the numbers”. Of course……….IF Mr. Moser is right…….the numbers could be a little more accurate.